When Georgia Ann Burrus was baptized at age 16 against the will of her parents, she revealed a courage and determination that would characterize the rest of her life. When Georgia Ann Burrus was baptized at age 16 against the will of her parents, she revealed a courage and determination that would characterize the rest of her life. Born in California in 1866, she attended Healdsburg College* in the same state and then taught at the Bible School in nearby Oakland. By the time she was 29, an unshakable yearning filled her heart for the salvation of people overseas. Georgia sailed to India in 1895, and when she set foot on a bustling dock in Calcutta, she became the first full-time Adventist missionary in India. She faced many challenges. In addition to being single at a time when it was uncommon for women to travel independently, she was one of the only Adventists in the country and the sole financier of her ministry. Her first task was to learn Bengali. As she grasped the basics of the language and immersed herself in the culture, she developed a longing for the salvation of Hindu girls, who numbered in the hundreds of thousands. This was a vast field, but she started small, opening a girls’ school with Martha May Taylor in 1896. The two women fed the poor, clothed the naked, taught the uneducated, and told them of a Savior they had never heard of before. Georgia loved her students deeply, and they loved her in return. They began urging her to visit their homes to meet their parents. One day Georgia visited the Biswas family. In those days the homes in India were like small compounds in which extended families lived together, the men and women occupying separate quarters. In the women’s quarter, Georgia met a beautiful 11-year-old girl named Nanibala. Georgia was surprised to learn that Nanibala was already a widow. An immediate bond developed between them. The next day when Georgia came to the Biswas’ home for her weekly lesson with Nanibala, she found the doors barred. She knocked several times, but no one responded. She decided to come back later, and this time she found the door unlocked. She slipped in and greeted Nanibala. They studied the Bible like old times, only now the other women glared at them coldly. After praying with Nanibala, Georgia left to return to her teaching. When Nanibala’s father returned from work, he was informed about the Bible study. Nanibala was beaten badly by her father and other members of her family. When she could stand the abuse no longer, she threw off all custom and ran out into the street. Providentially, Georgia was returning from a day of teaching at just that moment. She gathered the girl in her arms and took her to the home of Martha Taylor. Then she hurried back to the mission school to talk with the other missionaries about what they should do. When Georgia approached the school, she saw an angry mob of men, yelling for Nanibala to be returned to her parents at once. It was only through the intercession of Georgia’s language teacher, a high-ranking Brahman, that the men were pacified. He explained that Nanibala had chosen to become a Christian, and since she was of age, she could legally leave home. When he was finished, Nanibala’s father stepped forward. Changing his tack, he admitted that his family had abused the girl and that they were sorry. If she would just return home, he urged, they would apologize and return her the next day to the school where she would be free to become a Christian. When Georgia went to Martha Taylor’s home and explained the plan to Nanibala, she agreed to return home. But the next day, Mr. Biswas did not return his daughter to the mission as promised. Nor the next. Georgia went to the Biswas’ home, only to find the doors barred again. The Seventh-day Adventist missionaries in Calcutta held a prayer vigil for Nanibala that Friday evening. In the wee hours of Sunday morning, Georgia heard a loud rapping on her door. She opened it to see Nanibala trembling with fear. The missionary drew her inside, bolting the door behind her. The whole story tumbled out. After Nanibala had returned home, her father locked her in a room, swearing he’d murder her if she tried to escape. Nanibala pleaded with God not only to escape but for the opportunity to serve her newfound Savior. In those days, homes in India were built on all four sides of an open court, forming a complete enclosure. All through the week, workmen had been making repairs on the Biswas’ house. At quitting time on Friday evening, they had left a ladder lying in the court. On Saturday when she arose from her prayers, Nanibala looked out her window and spotted the ladder. At midnight when everyone was sleeping, Nanibala made her getaway. With the assistance of a sympathetic aunt, she escaped her room and hoisted the heavy ladder against the side of the house. Nimbly climbing it, she pulled herself onto the roof, scurried across it, and leapt to the street below. In the coming weeks, the Biswas family made several attempts to retrieve Nanibala from the mission. Her mother and grandmother came and with tears begged her to return. A rich woman hired by the Biswas tried to entice Nanibala with a promise of unimaginable comforts. Her father stationed men at the mission gates to grab her when she walked by. But all to no avail. 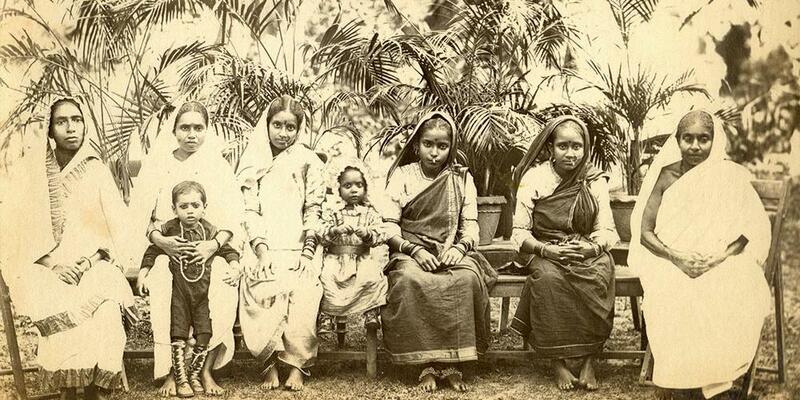 Nanibala was baptized in 1895, the first Hindu to become an Adventist. She had defied family, upbringing, culture, and religion for Jesus. In 1901 Nanibala came to the United States to study medicine, telling her amazing story to believers across the nation. She quickly became a symbol of the power of the Adventist message to overcome all barriers and a testament that with God’s grace the world can be reached with the gospel. Meanwhile, Georgia Burrus went on to serve as a missionary in India for nearly 40 years. These two women were firsts in a country that now has more than one million Adventists, more than any other nation in the world. * Currently Pacific Union College.